I received this from Orchard Books / Hachette in exchange for an honest review. As always, my reviews are fair and non-bias. A haunting mystery, romance in the vein of The Lovely Bones by New York Times bestselling author. "The yard of this house is a graveyard of moments and everything left behind is a clue. And I am here to dig." There's a ghost haunting 208 Water Street. She doesn't know who she was, or why she's still here. She does know that she is drawn to Maggie, the new girl in town, and her friends - beautiful, carefree Pauline and Liam, the boy who loves her. But the ghost isn't all that's lurking in Gill Creek... Someone is killing young girls all across the county. Can the ghost keep these three friends safe? Or does she have another purpose? The first thing that struck me was the beauty of the cover, with it's originality and almost haunting vibe. When I read the synopsis, that was it - it had to be read. Being compared to The Lovely Bones is an extremely praising quote - as above in the synopsis - and I agree with it 100%. I could forever quote all the haunting quotes, moments and pieces of The Moment Collector that sent shivers up my spine. I'm not usually the type of reader that dives into novels with "ghost" in the synopsis at all, but this is my rare exception. How often do you get to read from a ghost's point of view, watching the lives as they pass by? Maggie and her family move to Gill Creek in the opening to The Moment Collector after Maggie's Mom lost her job. Reserved, organised and book-worm Maggie slowly comes out of her shell when she starts to explore Gill Creek and witnessing her character evolve was one of my favourite things and although the beginning is a little slow paced, it's worth sticking with it. But this story isn't about Ghosts like a paranormal and fantasy read at all - it's one quite like no other. It's a coming-of-age novel about love, friendship and learning how to grow up in reality. There were other characters that brought their presence to the story; Pauline and Liam - and although they weren't my favourite sub-characters that I've read, I think they were perfect for this novel while not taking the spotlight from Maggie who was the sole focus. Her journey from the first page to the last was heartbreaking, but at the same time, beautiful. Overall, The Moment Collector was the dramatic, complex and emotional read I was expecting. I'm adding Jodi Lynn Anderson to my Authors to watch list because this won't be the last time I read a novel from her. 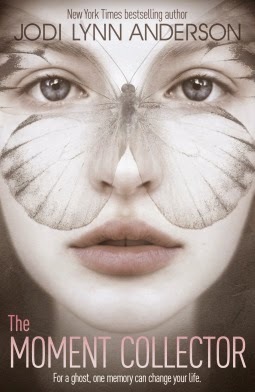 If you're looking for something like The Lovely Bones with a twist, you'll love this beyond words. The ending left me speechless - and I can't wait to hear what everyone loves about this one, too. By far one of my favourites this year. Like I said above, the ending was BEAUTIFUL. I dare you to read it to find out why. YA readers who love Mystery and an intriguing plot, but for Adults alike. Have you read The Moment Collector?